Thick and water-resistant oxford fabric. Tough light weight steel table legs, make it firm and stable. With 2 mesh pouches on the table surface to place your cups, user-friendly. ABS table base has anti-skid design. Extremely easily and fast set up and fold down. Can be stored in a carry bag, portable and convenient. Ideal for camping, picnic, and other outdoor activities. 1 Foldable Table, 2 Foldable Chairs and 1 Storage Bag. 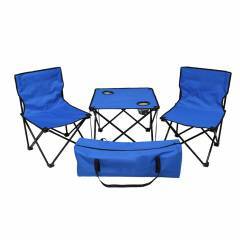 Kawachi Blue Folding Table & Chair Set, K357 is a premium quality Other Gardening Products from Kawachi. Moglix is a well-known ecommerce platform for qualitative range of Other Gardening Products. All Kawachi Blue Folding Table & Chair Set, K357 are manufactured by using quality assured material and advanced techniques, which make them up to the standard in this highly challenging field. The materials utilized to manufacture Kawachi Blue Folding Table & Chair Set, K357, are sourced from the most reliable and official Other Gardening Products vendors, chosen after performing detailed market surveys. Thus, Kawachi products are widely acknowledged in the market for their high quality. We are dedicatedly involved in providing an excellent quality array of Kawachi Other Gardening Products.